I'll note the closest city for location convenience. Mileage is from central Kansas City to the location. You might note that Kansas City, MO is one of the largest cities in the nation as far as square mile area is concerned. Many smaller cities abut Kansas City and of course your location will add or detract from the mileage significantly in many cases. I will not make comments about most of the sites since they are covered on trips pages if we have been there. I do feel that all are worth seeing given the time. I personally prefer the State Parks/Recreation Areas (MO, KS, NE, IA) and the Corps of Engineers sites. They tend to cost less and they generally are well cared for and have sufficient facilities. State Parks usually have showers, toilets, water, and a dump station. Corps of Engineers usually have similar facilities. In season is from April 1 to October 31 (Missouri) or near that in the other states. You might also note that you can now reserve a site at Corps of Engineers locations and also reserve a site at Missouri State Parks locations. This works out great to assure you of a space or for camper groups to obtain the space they need on those busy weekends. You will find on holiday weekends at popular sites that they start filling up on Thursday. If you want full hookups then you're going to have to look at a commercial campground generally speaking. Obviously your cost will be greater. I find that our motorhome will go 4 days or more without hooking up to anything if there are two adults using it. Electricity helps keep you from running the generator and is desirable. Your unit and occupancy will make some of your decisions for you on just how long you will last without hookups. Facilities listings at some of these sites are not always readily available on the Internet. You may want to check Woodall's or Trailer Life for a listing. Some simply are not found on the Internet and I'll list them here and tell you about them when I 'find' them. Some of these are small city or county operated sites. In all cases I suggest verification of site availability to fit your needs. Or you can 'wing it' if you like. If you're part of a group... then verification is a must. On a single unit basis I would imagine that in most cases you're going to be able to get a spot to stay. It may not always fit your wants but that's when the fun comes in! One might also note that the Missouri Parks are currently upgrading their facilities in many cases. This means that a couple of the parks may well be closed temporarily for such upgrades. Upgrades are reported to include such things as more campsites and 50 Amp electrical service. Check ahead for availability and be sure to make use of the Missouri Reservation System. Worlds of Fun Village (6 mi.) - For the Worlds of Fun Village, take exit #54 off of I-435 on the Missouri side. The Worlds of Fun Village is accessible only through the Oceans of Fun entrance which is located off of Parvin Road. New for 2005, Worlds of Fun Village at Worlds of Fun and Oceans of Fun is an all-new resort that features cozy cottages, charming log cabins, and luxury RV sites designed for the big rigs. For additional information, or to place a reservation, please call 1-800-877-4FUN, 816-453-7280, or visit worldsoffun.com. Miller's KamPark (16 mi.) - 145 1/2 Stewart Road, Liberty, MO 64068, 816-781-7724. Located just off I-35 at 152 Highway, this is another local campground. It is an older site but does have the facilities for extended stays also. Airport RV Park (26 mi.) - Platte City, MO Reports that they have 16 full hookups and they are available on a first com/first served basis. This is in downtown Platte City right off of I-29 just north of the Best Western Airport Inn. Basswood Country Inn and RV Resort (30 mi.) - Platte City, MO... Bed and breakfast and RV resort in Platte City, MO. 5 miles East of I-29 (exit 18) 120 total hook-ups tenting, 6 suites, condo style cabins, cottages, stocked fishing, wooded trails, pool, meeting rooms, full facilities. For more information, call (816) 792-7691. Leavenworth RV Park/M&M Fishing Lake (35 mi.) - 24836 Tonganoxie Road, Leavenworth, KS 66048 913-351-0505 (Res. 877-351-0505) 5 sites full hookup w/50 Amp service with more in development. Plenty of dry camping also available. Lewis and Clark State Park (46 mi.) - (Rushville, MO) East on US 59 to junction; follow 273 highway south 1 mile to entrance. 70 sites available, 44 with electricity. Camp area contains 1 shower house, a Laundromat and water fountains. For more information, call the Missouri Department of Natural Resources at (816) 579-5564. Beacon RV Park (45 mi.) - St Joseph, MO Located in town at the Beacon RV Dealer. Asphalt place to park your rig. 32 full hookups. Long term facilities. Atchison, KS (52 mi.) is also a close city and has the four following camping areas close to it. 16 sites with electricity and 1 central water hydrant. $5 per camper per day payable to the groundskeeper at the lake. For more information, call 367-5561. Stocked with bluegill, crappie, largemouth bass, channel catfish, carp, green sunfish and trout (in winter months). Located west of Huron on 326th Road. $3 for 2 days or less, $1 each additional day. Maximum stay length is 10 days for camping. Drinking water is included, no electricity. For more information call the Atchison County Courthouse at 367-1653 or Carl Strathmann at (785) 548-7727. Stocked with bullhead and channel catfish. Located about 3 miles north on highway 7 to 318th Road. Take 318th to Pawnee Road and follow Pawnee to the lake. No charge for camping. Drinking water available, no electricity. For more information, call John George at 367-6249. Stocked with bluegill, red-eared sunfish, largemouth bass, black crappie, walleye, channel catfish and flathead. Located at Bean Lake, MO, 9 miles East of Atchison on Missouri Hwy 45, 35 sites available with full hook-ups, includes water, electricity, cable, etc. Charge is $10.00 per day. $60.00 per week, and $135.00 per month. or... East on US 59 to junction; follow 273 highway south 5 miles to Bean Lake. 35 sites with full hookups (includes water, electricity and cable). $10 per day, $60 per week, $150 per month. If a guest is going to stay for more than a week or so then you have to either hook up your own power, (which only took the electric company less than three (3) hours to show up after the call) or use your generator. The park is also right on the lake and has many different fish in it. I also has a coin-op laundry facility in the middle of the place. The water and sewer is the only things that the rent covers, but is well worth it. It is very clean and the people that live there are very nic and courteous. This is a pet friendly park. For more information call (816) 579-9510. ATCHISON DUMP STATION Half-mile West of Country Mart on Hwy 59. Listing in Woodall's says it has 57 sites, most common site is 30 feet wide. 50 full hookups. Ol' MacDonald's Farm (62 mi.) - Savannah, MO (15603 County Line Road, Savannah, MO 64485) North on I-29 to Exit 53, 71 Highway (North of St Joseph, MO) 3 mi. to right on CR 344. Entrance on left. 104 sites 20 full (30 amp), 24 water & elec. (20 amp), 40+ no hookups. No dump station. Nice pool, volleyball area, and a couple of kids games (25 cents type). No fire rings. Site equipment is aging. Rodeo area near by. Walnut Grove Campground (62 mi.) - Savannah, MO Take I-29 to Exit 53 and north on Business 71 for 1/8 mile to CR 443. West 1/4 mile and you're there. 29 sites w/30 RV maximum length. 9 water & elec., 10 elec. (30 amp), 10 no hookups, 5 pull-thrus. AOK Campground (62 mi.) - Savannah, MO Located very close to the two above campgrounds... 1/4 mile north of Exit 53 and 1/4 mile west on a gravel road. 48 sites, 45 full hookups, 3 elec. only. Mission Lake (80 mi.) - Horton, KS (785)486-2324 for more info. Located North and East of Horton, KS a short distance... $5/day for camping. Boating, fishing, biking and other activities. Poosey State Conservation Area (83 mi.) - Located in the Poosey State Forest just south and east of Jamesport, MO. From the Chillicothe page - Poosey Conservation Area - Hwy 65 north to Hwy 190, west on 190 to Route A, north on Route A to Poosey Conservation Area, 660-646-6122. This area features almost 20 miles of interior roads that are open to mountain biking, horseback riding, and hiking. There are also two shooting ranges - one for firearms and one for archery. Country Squire Motel & RV Park (91 mi.) - Hiawatha, KS, 2000 Oregon Street 785-742-2877 16 spaces, 2 50 Amp, 12 full hook-up, 2 no sewer. $10 base with $2 per hookup chosen. $1 for cable TV. Mozingo Park (102 mi.) Maryville, MO 4 miles E of Maryville on Hwy 136 and then north on Liberty 1 mile. Mozingo Park offers 70 spacioius hard surfaced RV pads w/50 AMP Electric and water overlooking Mozingo Lake. $12/day. More info 660-562-8001. Mulberry Creek Family Retreat (105 mi.) Morrill, KS 66515 785-459-2533 (Res. 888-459-1595) From 36 & Hwy 75 Jct, E on 36 1 mile, N on Coyote Rd 4 miles, E on 270 St. 1/2 mile. 70 sites, shaded, 2 large swim pools, club/rec hall, pavilions and other facilities. Sycamore Springs Campground (107 mi.) Sabetha, KS (RR 3 #-18 Sabetha, KS 913-284-2436) Reported to be north of Sabetha, KS to 330 St and then east 2 miles and then south 1.5 miles. Facilities were great! The site is in the middle of an area of small Kansas towns just south of the Nebraska line. This draws a lot of the area folks for the recreational facilities which include miniature golf and a really nice roller rink. Camping is in two areas with full 50 amp service available along with full hookups. Tent campers are welcome and ther are tent areas. It is close enough to KC to be a real plus for area campers and is highly recommended! Stanton Lake Campground (110 mi.) - (Falls City, NE) City park campground provides electrical hookups in an asphalted parking lot. Water and dump station available in park. Shoemaker RV Park (143 mi.) - Bevier, MO These folks sell RVs and have an RV park at their location. You won't get better food than at the Pear Tree in Bevier. Winterset, IA (175 mi.) - Exit 52 off of I-35 in Iowa and go 14 miles west. Winterset is part of the South Central, Iowa area and there are several locations in this South Central area that are great spots to see. Particularly in Winterset there is a city campground that is great. It has 34 sites and provides water, sewer, and electric for $13/night. Madison County is of course the location of the now famous movie "The Bridges of Madison County" done by Clint Eastwood with Meryl Streep. Winterset is the birthplace of John Wayne. Lake Miola (43 mi.) Paola, KS. Camping permits may be purchased for the day or year. Electrical hook ups are available for an additional fee. There are 29 RV camping sites and 25 of them have gravel pads and hook ups. Camping is allowed year round and a dump station is located in the parking area on the southwest corner of the lake. Middle Creek RV Park (47 mi. ), 33643 S. Metcalf, Louisberg, KS 913-376-3304, 866-888-6779. www.rutladeroutpost.com has a new site that is 7 miles south of Louisberg. They have a small western town and campground located here. 24 sites, all pull-thrus & full hookups, 50 amp. Freeman, MO (49 mi.) Freeman Community Club RV Park (816)250-4868 - 2 Highway in Freeman, 8 campsites w/50 AMP electric, water, sewer w/pullthrus. $12/day and $10/day if longer than 7 days. Homewood RV Park (64 mi.) - 2161 Idaho Road, Williamsburg, KS 66095, 785-242-5601, (Exit 176) Small park midway between Kansas City and Emporia. 25 sites, 20/30/50 amp, pull-thrus. V&P RV Park (69 mi.) - 532 East South Street, Richmond, KS 66080, 785-835-6369, 25 sites, 30/50 amp, full hookups, pull-thrus. Garnett, KS (78 mi.) City Park on south end of town has five (5) sites with 50 AMP service and water. There is a city lake with a small blacktop camping area with hook-ups. To tentatively reserve a camping spot please call the Garnett Police Dispatch Center at (785) 448-6823. They will tell you what spots are available and information on key deposit, etc. When arriving in Garnett you will need to stop by the Garnett Police Dispatch office located at 131 West 5th Avenue to pay your fees and pick up your key. Lake Garnett is located on the north end of town and reportedly also has camping facilities. Another lake is just west (7 miles) of Garnett called Cedar Valley Reservoir and it too has camping facilities. Dry Camping at Lake near Montrose Wildlife Refuge. Talley Bend is a Corps of Engineers site. 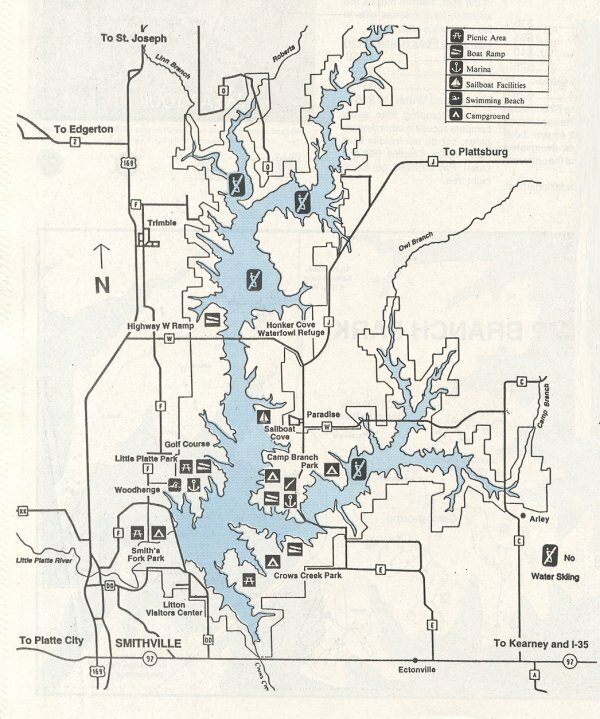 This Talley Bend link is also a link to a number of campgrounds (at least 30) in the Lake of the Ozarks area. They are all within a couple of hours of KC. About half of the list is commercial and the other half is Corps of Engineers/State Park. They are located around Warsaw, Clinton, Gravois Mills, Lake Ozark, Osage Beach, Linn Creek, and Camdenton. Danny Burns, Manager, P.O. Box 561, Osceola, MO 64776 Phone 417-646-8675 Email: rvpark@neighborlink.us We have at our park now 21 50 amp sites and 31 30 amp sites, cable TV, Wireless Internet, Clubhouse that is for the RV Clubs to use free of charge with a kitchen and heat and air-conditioning, shower house and we are on the Osage Arm of Truman Lake. Jayhawker RV Park & Campground (110 mi.) - 112 S. Broadway, LaHarpe, KS, 66751, 620-496-2431, 15 sites, all pull-thrus, 30/50 amps. Chanute, KS (125 mi.) - This town has a public RV park at 25th and Sante Fe, and there is no charge for the first three nights. It has 30 amp electricity and water at each of the sites and a dump station. The park is about a mile east of Hwy. 169 and is very clean. Emporia RV Park (127 mi.) - 4601 W. Hwy 50, Emporia, KS (Exit 127C), 620-343-3422, Nice park just off I-35 and 50 Highway at exit 127. 40 sites, w/pull-thrus, cable TV, LP and other facilities. Orleans Trail (146 mi.) - Situated at Stockton Lake the Corps of Engineers also provides camping facilities. Stockton Lake (146 mi.) - 33,000 acres of public land means Stockton Lake is a vacationer's paradise with recreational oppertunities including camping, hiking, horseback riding, and some of the best hunting and fishing you'll ever find! And watersports...Stockton Lake is one of the best sailing lakes in the Midwest. Scuba divers enjoy Stockton Lake's many unique features and creatures. Whether you are fishing for Walleye or Bass, skiing or parasailing you'll love all that Stockton Lake has to offer. Cottonwood Court (153 mi.) - POBox 5, 1002 N 8th Street, Fredonia, KS 66736, 620-378-3468, 13 sites, full hookups. Lake Pomme De Terre (158 mi.) - Hermitage, MO - Corps of Engineers Camping, Pomme De Terre State Park. Chuck Wagon RV Park (157 mi.) - 309 S. Jefferson, Eureka, KS 67045 620-583-6616, 11 sites, 30 amp, back-in spaces, full hook-ups. Stadium RV Park (9 mi.) - 10109 E 40 Highway, Independence, MO 64055, (816)353-0242. This park is located on 40 Highway just east of I-70 and Blue Ridge Cut-off... near the sports complex. Stated that they do not have a web page. The Camp-US RV Park (10 mi.) - (behind LDS Visitor Center and just east of the RLDS Auditorium), 406 South Pleasant, Independence, MO 64050, 816-254-1815. This is a good place to visit the Independence/KC area and stay in. Facilities are excellent. North & South Prairie Lee Park (23 mi.) - Lee's Summit, MO - Unknown if there are camping facilities or not. Unknown who runs it. Help? Trailside Camper's Inn of KC (24 mi.) - Has 97 sites, w/75 pull-thrus. 97 water/electric and 51 of these have sewer available. Trailside RV Sales is right next door. 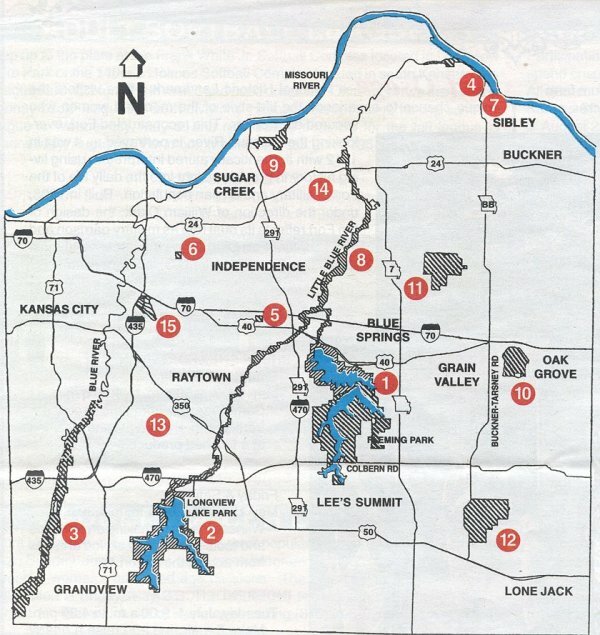 KOA - Kansas City East (28 mi.) - Oak Grove, MO Go north on H from Exit 28 and then east on 3rd street a couple of blocks. 88 sites w/32 full hookups. Bates City Campground (31 mi.) - RR 2 Box 72, Bates City, MO 64011 This is a motel with a campground beside it. Facilities unknown. Higginsville, MO (49 mi.) - Interstate RV Park located just off exit 49 at Higginsville on the south outer road. 30 full hookup sites w/50 AMP service. 20 pull-thrus. Lazy Days Camping & Fireworks (78 mi.) - 1/4 mile north and east of Marshall Junction (I-70 & US 65). 55 sites - 20 full hookups, 15 water and electric (30 amp), 20 no hookups. Katy Trail State Park (81 mi. to Clinton and 229 mi. to St. Charles) - This trail runs from Clinton to St. Charles and is quite extensive. There is camping, hiking and other activities all along it. Chaplin RV's (97 mi.) - 20 Sites available. Close to Missouri State Fair Grounds. Countryside Adult & Senior RV Park (98 mi.) - Sedalia, MO 38 sites... 28 with full hookups. No tents. Berry Bend (107 mi.) - Warsaw, MO - Corps of Engineers Campground - Berry Bend Campground is located on the Osage Arm of Truman Reservoir, approximately 9 miles southwest of Warsaw, Missouri. The park is covered with oak-hickory forest and is essentially a peninsula in a bend of the Osage River. The area is divided in half by a causeway with a campground and swimming beach to the south and a boat ramp, group picnic shelter and equestrian area to the north. The park and surrounding area has interesting topography and natural beauty. Berry Bend Campground contains a campground with 295 campsites - 113 with electrical hookups, shower and laundry facilities, children�s playground, and swimming beach. The Berry Bend South Campground is popular with fishermen. Directions: From Warsaw, 4.4 miles west on Mo Hwy 7, 3 miles west on State Route Z, 1.8 miles south on paved access road. 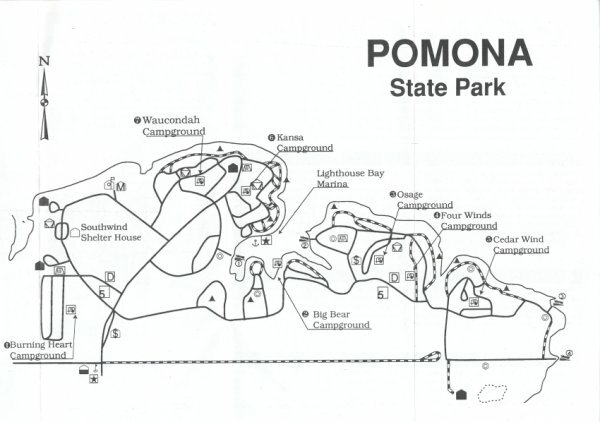 Campsite Fees: $10.00 per night (non-electric), $14.00 per night (electric), $16.00 per night (preferred site). Campers will find twelve campgrounds conveniently located around the shoreline of Truman Lake. The campgrounds at Truman Lake are some of the finest in the nation. Campgrounds typically contain paved roads, shower buildings, laundry facilities, level campsites - many with electrical hookups, fire rings, picnic tables, and lantern hanging posts. Please click on individual parks for specific information for directions, facilities, and fees for each campground. Port Perry R.V. Park (107 mi.) - Warsaw, MO is a privately owned campground near Warsaw. 30/50 AMP service available as well as full hookups. Warsaw, MO (107 mi.) campgrounds are listed here. <CLICK HERE> In this incomplete listing some are private and some public campgrounds/RV parks. Celebrity Turkey Hunt || Jubilee Days || Heritage Days || Trailside General Store has some interesting information on the area. Give it a try. Country Lakes RV Park (135 mi.) - South end of Warsaw off of the Wild Cat Drive Exit. This is a wonder site if you want to stay in the Warsaw area. Good RV Park with excellent facilities. Close to everything. The don't have a web page up at this time so I'm putting up what information that I have. Finger Lakes State Park (137 mi.) - Columbia, MO has motorcycle and all terrain vehicle access. Walnut Grove RV Park (10 mi.) - 10218 Johnson Drive, Merriam, KS, 913-262-3023, 56 Sites, 50 Amps avail. In town and convenient. Cottonwood Camping RV Park & Campground (19 mi.) - 115 S. 130th St., Bonner Springs, KS 66012, 913/422-8038 (.4 mi south of I-70 on KS 7 Hwy.) 40 sites w/50 amp service and full hookups. 60 more sites available. KOA Lawrence/Kansas City (38 mi.) - 1473 Hwy 40, Lawrence, KS 66044 785-842-3877 has 113 sites, 51 pull-thrus, 30/50 amp, LP, modem hookup in office. KOA Topeka (60 mi.) - 3366 KOA Road, Grantville, KS 66429, 785-246-3419 (Res. 800-562-8717) 50 sites w/pull-thrus. Capitol City RV Park (66 mi.) - 1949 SW 49th St, Topeka, KS 66609, 785-862-5267, 51 sites w/pull-thrus, full hookups (50 amp) and other standard facilities. Prairie Schooner RV Park & Campground (87 mi.) - 15680 Pacific Street, Mayetta, KS 66509 (North of Topeka), 785-966-2952, 39 sites, w/pull-thrus available, 30/50 amp. Mill Creek Campground & RV Park (95 mi.) - R. 1, Box 54, Paxico, KS 66526 785-636-5321, 45 sites w/pull-thrus, 31 full hookups, 30/50 amps. Lyndon, KS (95 mi.) City Park has a reported three (3) campsites that are free. The city park at 10th and Topeka Ave., offers three hookups sites at no charge for stays up to a week. Lyndon is 27 miles south of Topeka on Highway 75 and is close to Pomona and Melvern lakes. The park includes a two-story log house (circa 1870), a play area, covered shelters, picnic tables and restrooms (open in summer only). Shops are nearby. For more info contact the city office at 785-828-3146. Thunderbird Marina (129 mi.) - On Milford Lake 6515 West Rolling Hills Rd., Junction City, KS, 66441, 785-238-5864, 97 sites w/8 cabins, RV hookups, tenting, water-front cabins. Abilene, KS (151 mi.) is the boyhood home of former president Dwight D. Eisenhower. There is a museum and other points of interest here. Camping is available off of Abilene's main I-70 exit 275 at Covered Wagon RV Park and also at exit 272 at Econo RV Park, exit 281 at Four Seasons RV Acres. Most sites listed are less than 3 hours from downtown KC. Elk City and Fall River are a stretch. Note mileage figures. Information about commercial campgrounds in Missouri. 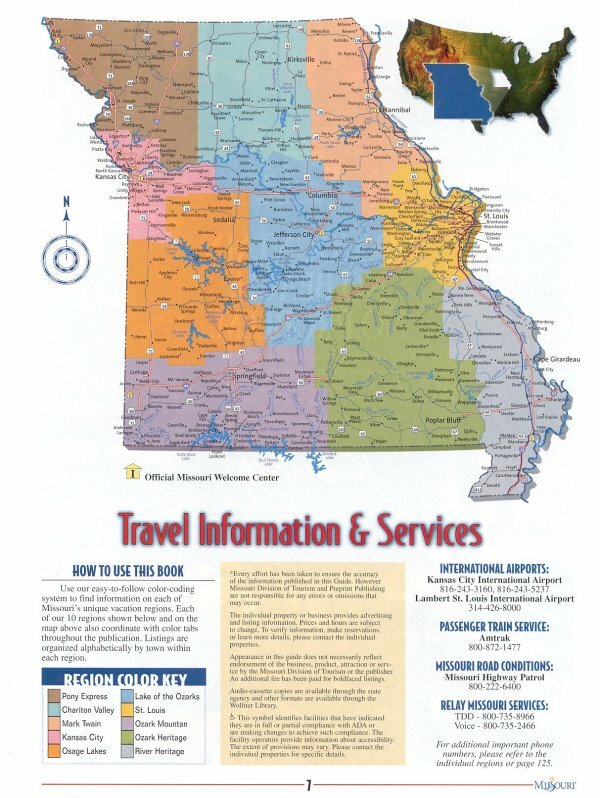 This following listing is from the Missouri 2000 Official Travel Guide. 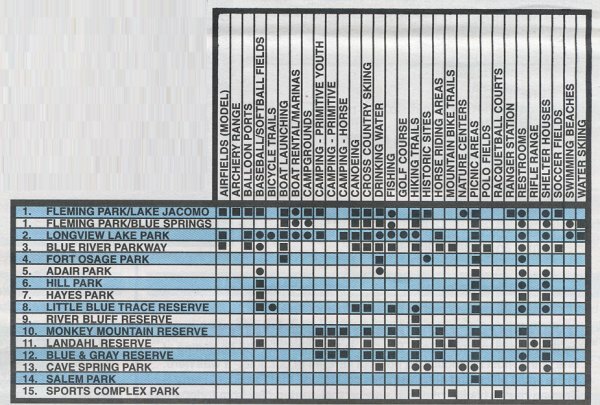 It is by no means complete and in fact I've noticed a lot of county operated parks that simply are not listed. Listed sites do have facilities available listings and contact information. Kansas Association of RV Parks and Campgrounds - Information about commercial campgrounds in Kansas. Kansas does allow overnight parking at its rest stops. Some along I-70 have dumps and water. There are around 30-40 state fishing lakes in Kansas where you can camp overnight free. I don't know what the limit is for staying. Most are off the beaten path with no facilities and it's dry camping only. Kansas Communities on the Net - A good listing to see what's in Kansas to see and do. Nebraska Association of Private Campgrounds - Information about commercial campgrounds in Nebraska. Iowa Association of Campground Owners - Information about commercial campgrounds in Iowa. Central Iowa Tourism - what to see and do in Iowa. The following sites have various listings of RV Parks, Campgrounds and other recreational facilities in the areas around KC. They represent only a few sites of what the Internet has to offer but are an excellent start. A resource of information about local chamber of commerce contact points. This page seems to have some problems but it will give you an address. Not much more... but that's a start to write to for information. City Information: www.clickcity.com is another resource for city information. Here is the Kansas City Area we are blessed with a number of sites to visit while just a little farther out (three day weekend material) we have wonderful sites galore in the Branson, MO area, St Louis area, Omaha, NE area, central Kansas and of course Iowa. There are some wonderful sites in Arkansas, Oklahoma, and Illinois also 'just a little farther' from the Kansas City Area. Crystal Springs Park close also. Minden, NE (329 mi.) really needs a four day weekend but is well worth the trip. Harold Warp's Pioneer Village is really a site to see. $7 (1999) will get you in to see it and you can stay as long as it takes. They have a campground associated with Pioneer Village so the stay is made easy. A motel is there also for those without an RV. Hermann, MO (190 mi.) - Camping is available both in the City Park and on the Katy Trail, along with Lazy Day Campground. Branson, Missouri (249 mi.) has myriads of camping sites, RV sites, and sites to see with things to do: ( www.branson.com , www.branson.net , www.bransonnow.com , www.bransonaccess.com , and other sites such as www.rv-america.com have listings for campgrounds ) Let's not forget that Silver Dollar City is close to Branson. Really neat for the kids and adults alike. Rathbun Lake (183 mi.) - Rathbun, IA Corps of Engineers site has five (5) campgrounds listed with 501 campsites. Centerville, IA is also close here. Amana, Iowa (297 mi.) - Amana is the site of the Iowa State Rally for Coachmen on occasion. It is also an excellent area to visit with its Amish history. There are numerous camping facilities including some right in the city. Amana Colonies RV Park comes in second on my recommendations. Try Amana City Park first. You'll find a more pleasant atmosphere there and services are certainly just as good. Har-Ber Village in Grove, OK (211 mi.) - Har-Ber Village has grown into one of the largest antique museums in the United States since it was begun in 1968. Built as a gift to the traveling public from Harvey and Bernice Jones, Har-Ber Village is a reconstructed turn-of-the-century village of over one hundred buildings and collections. It started with a statue of Christ overlooking the lake and has become one of the most popular attractions in the Grand Lake area-attracting over four hundred thousand visitors each year. Seemingly endless collections of china, household equipment, furnishings, dolls, glassware, brass and more are displayed in authentic, reconstructed log cabins. The grounds are covered with display after display of antique farm implements, a waterwheel, and other treasures from the late 1800s and early 1900s. Grove, OK also sports Grand Lake of the Cherokees which is a fantastic fishing and boating area. There is plenty of camping around the lake area.